Friday, September 9 at 3:00 p.m.
A Boston College and U.S. Jesuit icon, Father Clifford was the founding dean of B.C.’s School of Theology and Ministry, has taught approximately 4,000 students (including some 40 percent of all U.S. Jesuits), and is a prolific and noteworthy biblical scholar. 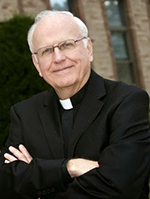 To view a recording of Father Clifford’s talk, please click here. Friday, September 23 at 3:00 p.m.
A scholar, activist, and playwright, Clayborne Carson is one of the foremost experts on the life and legacy of Martin Luther King. He began the King Papers Project in collaboration with the late Coretta Scott King in 1985. Twenty years later, Prof. Carlson founded Stanford’s Martin Luther King, Jr. Research and Education institute to endow and expand the work of the King Papers Project. To view a recording of Dr. Carson’s talk, please click here. Friday, October 7 at 3:00 p.m.
Prof. Garcia has been a Boston College faculty member since 2000, having previously taught at Rutgers University, Georgetown University, and the University of Notre Dame. His scholarly specialties include applied and theoretical ethics in areas such as race, ethnicity, and ethnic perspectives on medical ethics. To view a recording of Dr. Garcia’s talk, please click here. Friday, October 14 at 3:00 p.m.
Prof. Henderson is a leading expert on ancient Greek drama, as well as the Greek language, Ancient Greece, and Ancient Rome. A former Guggenheim Fellow, Prof. Henderson was the founding director of the College of Arts and Sciences Honors Program at B.U., where he has been a faculty member since 1991, and is the current editor of Harvard University’s Loeb Classical Library. To view a recording of Dr. Henderson’s talk, please click here. Based in Boston, Blue Heron is a vocal ensemble renowned for startlingly authentic live performances of works of the Renaissance and Medieval periods. Friday, December 2 at 3:00 p.m.
Frank Daly is a Kallman Executive Fellow at the W. Michael Hoffman Center for Business Ethics at Bentley University. He was the Ethics Officer for a Fortune 100 Corporation and the Chair of the Ethics Officer Association. 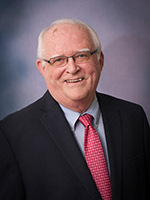 Frank served as a part-time faculty member in the School of Business Administration at Loyola Marymount University and an Executive Fellow at the Markkula Center for Ethics at Santa Clara University. This spring he was a panelist in a colloquium sponsored by Real Colegio Complutense of Madrid at Harvard University on “Trust in the Workplace and Meaningful Work.” Frank was educated in Philosophy and Theology and is currently exploring a return to ministry.